specific feature, like as the morphology signs. songs from everyone) are made. thousand songs. Types of songs are marked by Latin letters. length of syllables (sec), intervals between songs (sec). coelebs L.) defined (determined) only a long trill, frequently with the sharp termination (ending) in the end. was subdivided on 1Р° and 16). phrases or a knee (oscillation) . songs of chaffinch, which have been recorded in population of Curonian spit (N = 153 of males). two phrases in song type C.
(2-nd phrase of trill in song type C). 4) Syllables (elements) are divided (shared) by intervals, but frequently shorter, than at phrases. therefore it such sharp, remarkable, вЂњbrightвЂќ on hearing). example of song type C (Figure 2). of certain territory or in repertoire of one male. trill, a final stroke), which of them (parts) can be subdivided into phrases (the second order) (Figure 1). 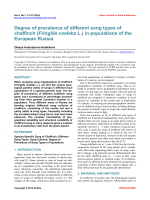 dialects of songs can exist together in one local population, probably, as a result of mixture of traditions of different song cultures during migrations [14,15]. to present variants of song type O (Figure 3). give the new song type at the development. elements similar in the form. Figure 1. 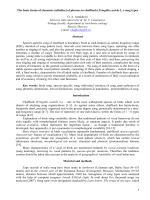 The analysis of structure of song type РЎ of chaffinch (Fringilla coelebs L.). points: (a) song type C; (b) Song type РЎ*11; (c) Song type РЎ3; (d) Song type РЎ4; (e) Song type РЎ5; (f) Song type РЎ6. type O; (b) Song type Рћ1; (c) Song type Рћ2; (d) Song type Рћ3; (e) Song type Рћ4; (f) Song type Рћ5. The identification of individual variation of genes of species-species song. Table 1. 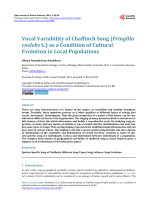 The basic time-and-frequency characteristics of song type C of chaffinch (Fringilla coelebs L.). Nottebohm, F. (1969) The вЂњcritical periodвЂќ for song leaning in birds. Ibis, 111, 386-387. 14th International Ornithology Congress, Blackwell Science Publishers, Oxford-Р•dinburg, 265-280.
chaffinch song. 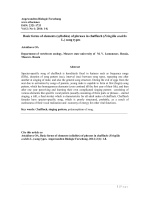 Behaviour, 71, 146-166.
prof. G. N. Simkin for valuable advice at the analysis of a material. 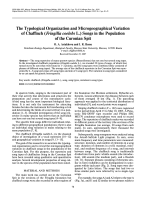 Marler, P. (1956) The voice of the chaffinch and its function as a language. Ibis, 98, 231-261.
des Buchfinken. Journal of Ornit, 87, 568-592.
birds, with especial reference to the song chaffinch Fringilla coelebs. Ibis, 100, 535-570.
seasonal flights of birds. Zoology Journal, 10, 17-40. Jellis, R. (1977) Bird sounds and their meaning. Cambridge, 256.
indigo buntings. The Auk, 87, 58-71.
question of dialects. Behaviour, 88, 76-97.